The Craft Cow is a comfortable homely pub, majoring in catering for good times for all the family through the generations from grandma (a nice glass of sherry, followed by Sunday roast) down to the newest great grandchild (homemade fish bites and a rumble around their well-stocked playpen). They are in the Christmas spirit bigtime with a party menu to suit everybody including of course traditional roast turkey that will allow mum to take a rest and let someone else take the strain. We popped in on a Tuesday night and I must admit it wasn’t Christmas yet, but I was looking for someone else to dish up my dinner and more importantly clear it up! We’d already had a look at the menu online and hoped for great things in the shape of wholesome simple dishes, coupled with that important pint of ale – in this case Birra Moretti. We weren’t disappointed and chose from the small plates to start: ham hock scotch egg with piccalilli and deep fried whitebait with tartare sauce. You can have three of these small plates for £12.00 but as my body is a temple, we only ordered two to share, and as it happened the plates were small but the portions enormous so £12.00 for three is particularly good value. For the main course, I chose half a roasted chicken with sweet potato fries, herb butter and blue cheese coleslaw, and my husband the cider battered haddock and chips with tartare sauce and mushy peas. 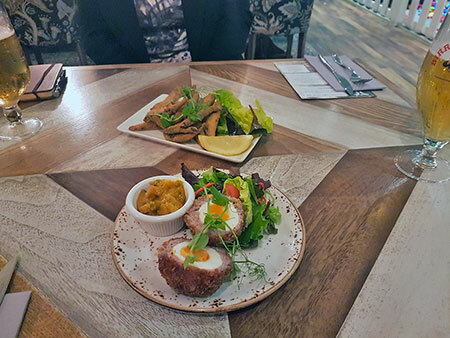 Our starters arrived teetering over the edge of their small plates, my whitebait was crisp and tasty, and I was impressed that the ham hock scotch egg had a lightly set yoke which is all the rage and they were both delicious. Whilst waiting for our main courses we chatted about the pub quiz which was advertised with a first prize worth trying for in the shape of a £50 bar tab but felt our IQs probably wouldn’t make the grade, unless we invited along a few friends with better memories and a working knowledge of soap opera! 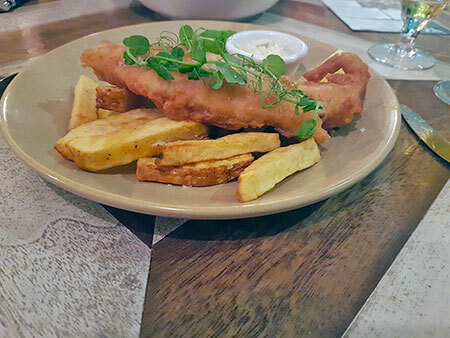 We tucked into our main courses with gusto – the chicken was tender and succulent and I liked the additional of the garlic butter; the cider battered haddock filled the plate but nonetheless my husband managed to finish it down to the last bit of crispy batter. 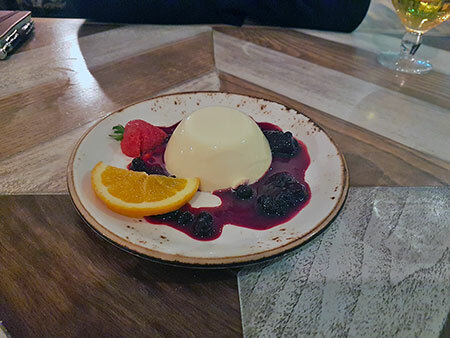 After all this we weren’t sure we could manage a dessert but panna cotta with cranberries and winter berry compote took our eye and we shared one. It was lovely; just the right amount of wobble teamed with the tangy compote, and coupled with a very reasonable bill, we thought our evening great value.